The Homicide, Ministers & Community Alliance (HMCA) assists families who are coping with the homicide of a loved one. For more information, click here. 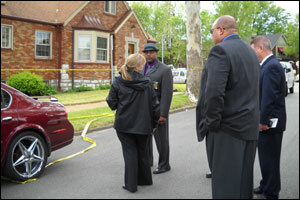 Homicide Detectives are available on a 24-hour basis to respond to incidents. The moments and hours immediately following a homicide are often the most important for investigators. Detectives will examine the scene of the incident, locate and interview witnesses, speak with family members or friends who may have relevant information and work concurrently with other units in an attempt to develop suspect information. The investigations are complex as Detectives work to ensure they can present a strong case to the Circuit Attorney’s Office for prosecution. UCR: Uniform Crime Reporting, a program used by the FBI to accurately measure crime across the country. It determines the criteria used in classifying crimes. Clearance Rate: The ratio of reported cases to cleared cases. A “cleared” case is one where investigators have determined who is responsible for the crime and the person has either been arrested or arrest is not possible because the suspect is deceased, incarcerated elsewhere etc.. It should be noted that should a crime occur in one month or year and the arrest is made in a subsequent month or year, the month or year of arrest is the month or year of clearance according to FBI clearance guidelines. Issue Rate: The ratio of cleared cases to cases where warrants (charges) are issued by the Circuit Attorney’s Office. 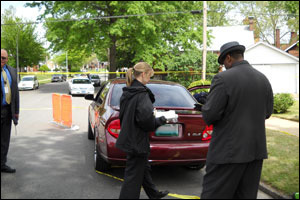 The Homicide Division investigates cases where a victim is killed as a result of the actions of another person. Investigators in the Homicide Division also respond when a death may not be immediately apparent to be a homicide but the death is considered suspicious.